Wall Drug has a rich history in the state of South Dakota. Nestled in the city of Wall in the western part of the state, Wall Drug has grown from its humble beginnings in 1931 to a thriving oasis. Wall Drug offers dining, activities, gifts and souvenirs, visitor information and, of course, free ice water. Many road-worn travelers stop at Wall Drug and leave awake and refreshed, just like they did more than 80 years ago. But it wasn’t always a thriving business, attracting 2 million visitors each year to the small town of Wall. Ted and Dorothy Hustead struggled to make Wall Drug successful in the early days. The city of Wall was somewhat affectionately known as “the geographical center of nowhere” back then and, to compound the challenges, the Great Depression was taking hold across the United States. But the story of Wall Drug was a story of success because one simple idea took root: Offering road weary travelers free ice water. Soon travelers would make a point to stop at Wall Drug to enjoy a refreshing break and they haven’t stopped coming to Wall Drug since. Today, Wall Drug continues to offer the same amenities that made it a must-stop destination all those years ago, and visitors still stop to stretch their legs, eat a delicious home-style meal and drink some free, rejuvenating ice-cold water. 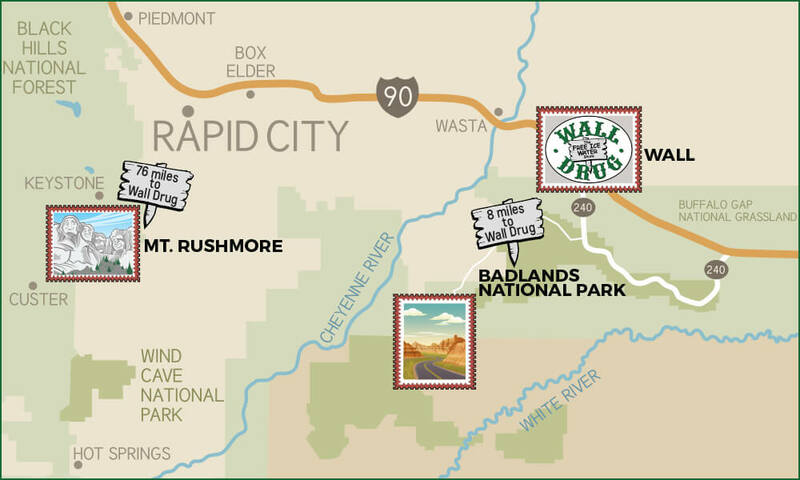 The city of Wall, South Dakota is home to 800 year-round residents and, thanks to Wall Drug, one of the most popular attractions in the state, drawing in more than 2 million visitors each year. Stop at Wall Drug and see what the excitement is all about.